Over the last few months we have focused on strengthening existing plans for the growth of our association. Next to the relevant conferences and training opportunities, we have updated the information on all the organizations, networks and institutes that are involved in historical demographic research and education on our website. If you are aware of any information that is still missing, please let us know. During the next month a list of journals in which historical demographers frequently publish will also be added. To be more accessible and to connect young historical demographers with each other even more we have set up a Twitter account alongside our Facebook group and page. To connect people in real life we are organizing a couple of informal events at upcoming conference. We are pleased to inform you that during the European Social Science History Conference in Belfast, we have a meet-up on Friday the 6th of April at 19:00 in the Small Library Room of the historical bar and restaurant The Parlour Bar. The bar is located very near to the Queen’s University. During this event we can to get to know each other better, exchange research ideas and more importantly have a nice evening with peers. Please register with Tim Riswick if you are planning to join so we can confirm our reservation for The Parlour Bar! A second event will be organised at the European Population Conference (EAPS) in Brussels (June 6-9 2018). Keep an eye on our Facebook, Twitter, and website for details. Please join us if you are planning to attend either of these two conference! 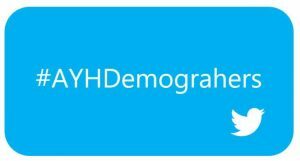 If you are on Twitter don’t forget to tag us @AYHDemographers if you yourself are presenting or see a presentation by one of us! Otherwise, please send pictures of your presentation and experience from the conference so we can post about them. You can either pm or send an e-mail to Stephanie Thiehoff. Lastly, our board has changed again. On the one hand our PR-Officer Edward Morgan has decided to leave academia for now, and therefore also resigns from his role on the board. We would like to thank Edward for everything: he has been a constructive contributor from the start and the driving force behind our website. On the other hand, we are happy to welcome Evelien Walhout as our new secretary. You can read more about Evelien at the end of this newsletter.